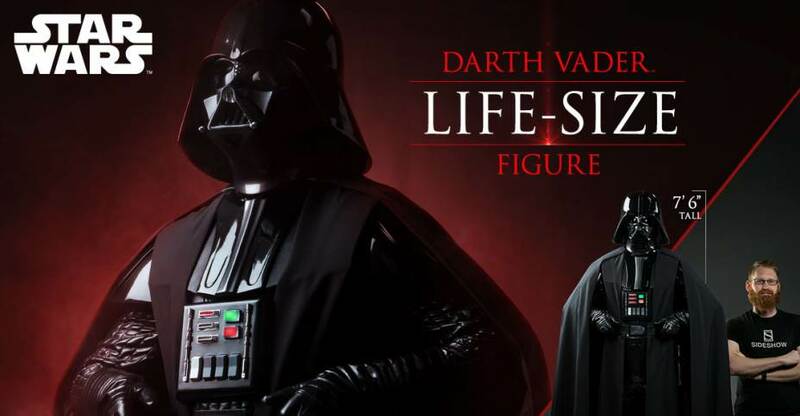 A new Star Wars Darth Vader Life Size Figure (not an action figure) has been revealed by Sideshow Collectibles. The new statue stands over 7 feet 6 inches tall! It joins the previously released Han Solo in Carbonite, Boba Fett, Stormtrooper, R2-D2, and Yoda life size collectibles. 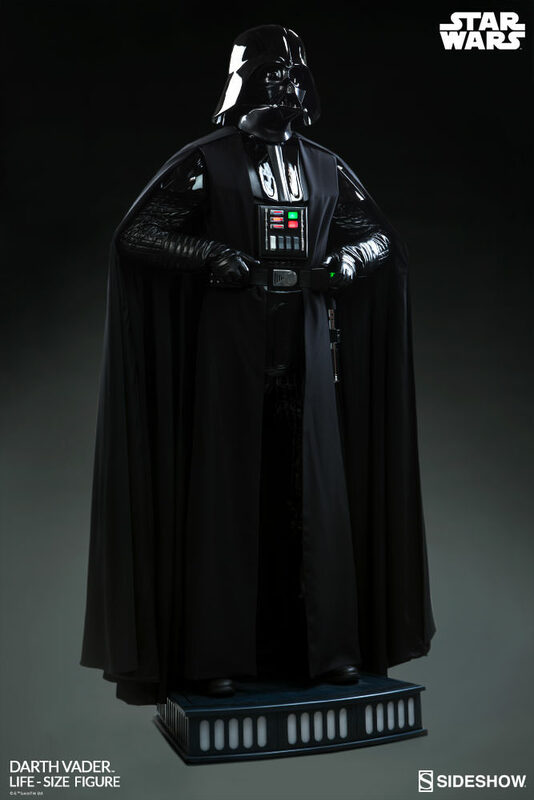 Darth Vader features LED light up functions and a finely tailored cloth outfit. 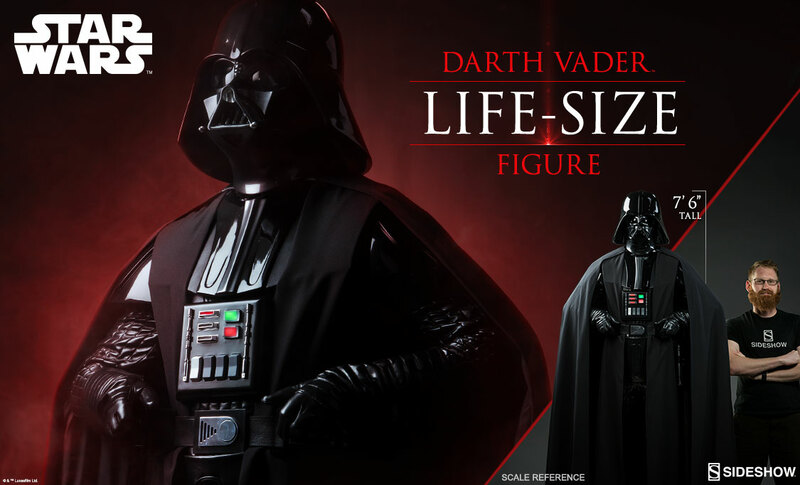 No word if this is a completely new statue or a reissue of their previously released Life Size Darth Vader. Pre-order dates haven’t been announced yet. We’ll update with additional photos and details as they become available. Click the banner image for a full preview. Man that is huge and impressive. Vader's height is around 6.75. Chewbacca is 7'6 so this sucker is Chewy height... man! Be cool if it was Vader's actual height though because it would seem like the Sith Lord is standing in your living room. Not that I'll ever own this though... this is prob the price of a good used car. It's likely that large due to the base that will be included. The 1st one they did had a 12" or so tall base. Ok, I gotcha. Makes it even better. Now, lets mortgage my house to get it. Does it do Vader's mechanical breathing? It has to. And... who's placing a bet for the estimated price? I'm going for 2,000. Add a zero if it HAS Vader's signature breathing. It will be $8,000 or more. Boba Fett currently sells for $8,500. If I had the money I would buy that in a second. I'm sad to say this would barely fit in my house. I need get a bigger house just to even own this bad boy. I bet the shipping costs alone will be killer.